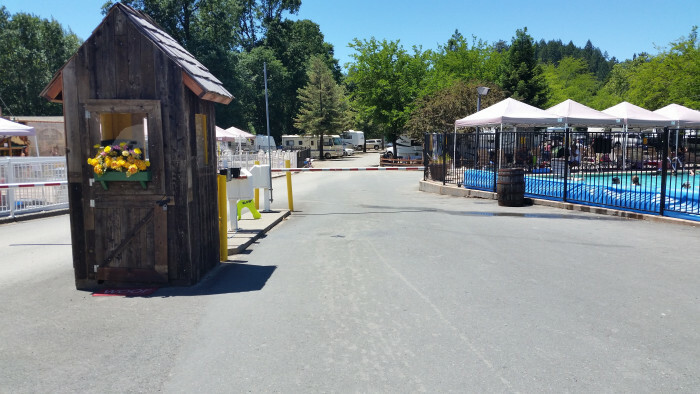 Ask fellow campers about "Willits KOA" and nearby attractions. We chose this park as a base to explore the Ft Bragg area,not wanting to travel CA 20 in our 40ft bus. The park was very nice and clean with all hookups working fine.There seem to be a lot of things going on during the summer,but most were shut down during our stay in the winter. The staff was very friendly and easy to deal with. Pool and hot tub were closed for the winter,this was posted on their web site. There are 3 sites with your own hot tub,they are $20 a night higher. We upgraded for 2 nights of our week long stay to one of them,money well spent!!!! We camped at Willits KOA in a Motorhome. Explore Ft Bragg,a great day trip. Check out glass beach,yes we took some home!! Safeway in town is a great store with good fuel prices and easy in and out with your rig. I believe summer would be a blast in this park,especially if you have kids or grand kids. Office person who checked us in was very nice & helpful. It started raining when we pulled in our site to get set up. Everything was okay until we tried to pull out the next morning. We couldn’t make the tight turn to get out of our site. Eventually we made it out, but it was much harder than it should’ve been. We didn’t use any of the amenities, but they had lots to do especially for families with kids. Just stayed one night. Would probably not stay again if we could find something else because of how hard it was for us to get out of our site. 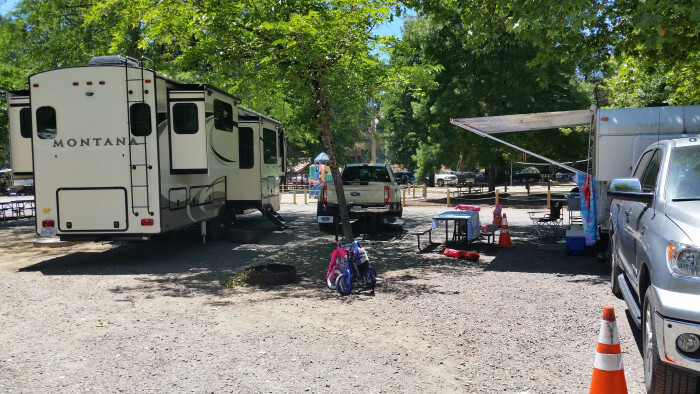 We camped at Willits KOA in a Fifth Wheel. 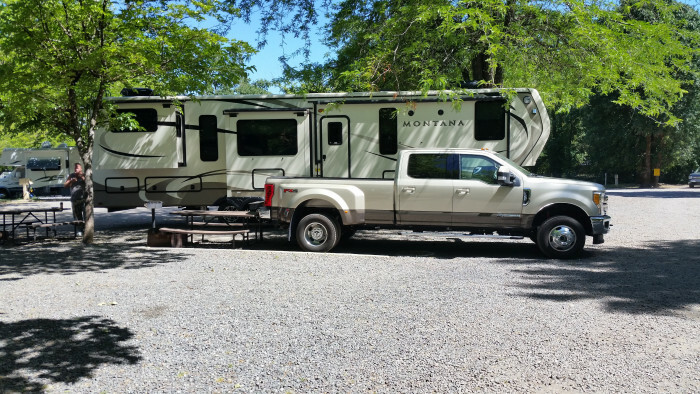 This KOA is NOT big rig friendly, so navigating the interior roads with our 40' fifth wheel and tow dually was a challenge! We stayed in site 23, a mostly level pull through site which we were told was 50' long (it wasn't). The site was too short for our rig, so our back end stuck out in the road a bit. We parked our dually next to our rig, but it was so tight that we had the bumper nearly touching the stand-up grill and picnic table. Trees at our site desperately needed to be trimmed due to low hanging branches. 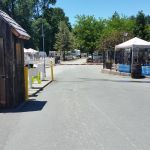 The rv sites are very close together, with most having a "buddy" site configuration so that your awning is facing your neighbor's awning which was awkward and intrusive. 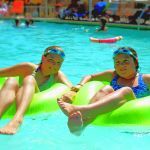 This KOA is designed for children and families with no shortage of kid friendly amenities (too many to list!). The KOA has day use passes available to the public, so the weekend was packed with those not paying to camp but using the facilities/amenities. They walked through camper's sites constantly. Bathrooms were cleaned daily but are heavily used so they get dirty quickly. Narrow entrance/exit gate so take care. Dump station is located just outside the exit gate, which resulted in a long wait in line of RVs before we were finally able to leave. Stocked store on site with snacks/gifts/RV supplies. Interior roads and sites are gravel with varying degrees of levelness and are a mix of pull throughs, back-ins, cabin rentals, tent sites and rv rentals. Utilities worked well and Verizon signal was good. Free WiFi available but we didn't use it. 10 channels of cable included in price. Rate is with KOA Value card and additional $25 off with KOA points. Overall, this place is great for smaller rigs and families, but not for big rigs and those traveling without kids. We won't be back. We camped at Willits KOA in a Fifth Wheel. Safeway grocery is located less than two miles from the park. We stayed three nights on this trip. We visit this KOA 1-2 times per year. The pull through sites are more level than the back-in sites along the fence. We had a back-in this time and were very happy with it. They feel more private than the pull through sites in the middle of the park. They have a morning honey wagon service for $7 although be warned they will charge you $20 if you try to do it the morning of. You can dump for free at the entrance on your way out. This KOA has the best amenities for kids of any I've been to. Pool, hot tub, mini golf, petting zoo, tire park, fishing pond, outdoor movies, ice cream social, splash park, and giant play structure to name some. We camped at Willits KOA in a Travel Trailer. The Safeway at the intersection of Main St and Hwy 20 is the best place to get groceries and gas. The town of Ukiah, 20 miles away is the nearest bigger town to visit Walmart, Costco (opening soon), and a bigger selection of restaurants. I do not recommend ever staying here. The ownership is the absolute worst. Their employees have no idea what they are doing and are unbelievably inconsiderate. They hold no responsibility for their actions and don't know how to properly run a business. Not only are the roads in the KOA a pothole MESS, but they close off the amenities on a constant basis. On top of that, they are EXTREMELY overpriced. There are dozens of better places to stay than this KOA. Do yourself a favor and cross this one off your list. We camped at Willits KOA in a Motorhome. This park did not start well with us. We showed up about 11:00 and they informed us that their policy was $10 per hour for early check-in. I felt like they had us over a barrel. Where was I to go for 2 hours? They said it was for the extra work someone would have to do to get it ready. I paid it and was sent to a spot that was not appropriate for my 5th wheel and certainly not clean either. Luckily, one of the staff was nearby and helped me get another site and was better for the RV but again not that clean. The park has more components than any park I have ever been in. Pool, splash park,, kiddie pool, hot tub, mini golf, turtles, petting zoo. ghost town, disc golf. Train station, Lots to do but there are lots of "NO" signs everywhere. I have never seen so much signage in a park. The roads and sites are all gravel and there was quite a bit of trash around my site. As for the early fee...I went back the next day to complain and was eventually told they would give me a refund. When the statement came in it was for half of the early fee. I am not impressed with their customer service or the cleanliness of the park. 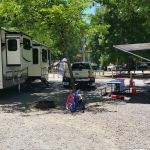 We camped at Willits KOA in a Fifth Wheel. I stayed at this campground because I brought my 11 year old granddaughter. The campground is very family oriented. However, I disagree with letting the public come in and pay for a day pass. I paid a lot for camping and expected it to be for paying campers. I could of saved a lot of money and stayed at a different campground and just came in for the day and got the same as I paid a lot more for. We camped at Willits KOA in a Travel Trailer. This was an overnight stop. Easy park off 20 from the 101. Good Verizon and T-Mobile. Park has cable but did not use. There are some satellite friendly sites, ask in advance. FHU's in average condition, good electricity and water pressure. Wifi worked, but had to use my booster. The park was quiet when we were here. Small park sites seemed level, but saw a few that had boards. There are many cabins here, pool and water park of sorts. Also lots more things to do for the kids. There are 3 Prestige sites that seemed to have more room (sideways pull throughs). We were in site 27, had satellite signal. Site level. Nice end site but on the short side, room for toad. We camped at Willits KOA in a Motorhome. For gassers use the Safeway at 101 and 20. Has nice pull throughs, diesel also. Stayed here overnight on a trip from Oregon to Florida. Not far from the intersection of US-101 and SR-20 about twenty miles from the Pacific coast. Clean park great for families who need plenty of things for the kids to do. Rate is for winter with only electric and water. Noise was a bit of a problem with all that is going on, but okay for overnight. This park was one of two on our route, so we didn't have any options. We camped at Willits KOA in a Travel Trailer. SR-20 from Willits to Fort Bragg has restrictions on length because it is a curvy mountain road, but has beautiful scenery. US-101 is much easier for a rig of any size. I would recommend US-101 to get to the coast. 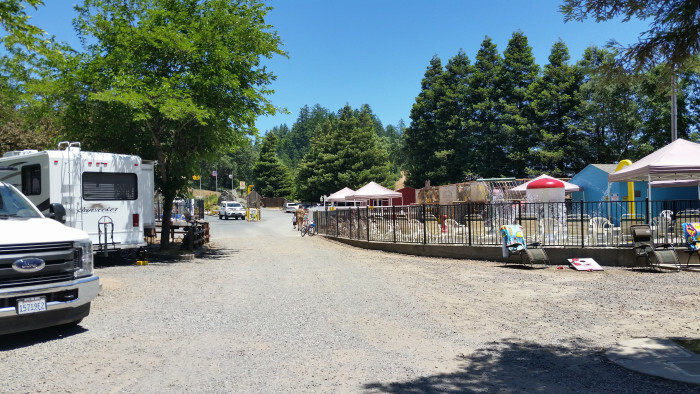 Willits is a small town with limited shopping and restaurants. Stayed 3 nights including Halloween night. What a fun time. Most of the sites are decorated. The kids trick or treating. the Haunted House was terrific. What a great job by the Owners and Staff. We camped at Willits KOA in a Fifth Wheel. A lot of things to do for families at this Koa. Close the coast and beautiful views. We enjoyed our stay and would come again! 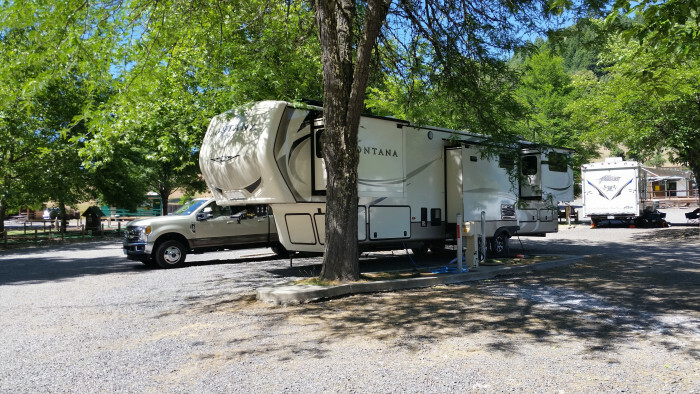 We camped at Willits KOA in a Fifth Wheel. 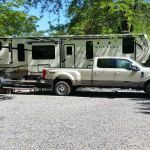 Our truck broke down and were greeted by friendly staff who allowed our Travel Trailer to be towed in and parked while we got our truck repaired (3 days, busy holiday travel time). It was a very stressful time for us and the kind of service and the site they put us in was much appreciated. We were stuck with no transportation and so got to really enjoy the park. There is definitely a lot to do here. We took a nice walk up to & around their fishing pond, visited their petting zoo, sat on the lounge chairs in the water park and relaxed to the peaceful sound of water falling down like a waterfall. We visited their old western village and pool. They offer a game room, fully stocked store, hot tubs, a great miniature golf course, multiple children's playgrounds, a dog playground, a basketball court, a volleyball court & horseshoes. They even offer a Zen garden & a Skunk Train depo. I rated 4 start for value only because I feel RV at parks have gotten almost as pricey as some nice motel resorts. And, if you do not have a KOA membership, then my site would have cost someone in the tune of $80. I gave a 4 star for cleanliness only because it would be nice if more gavel was on the roads to lay down the traffic dust that is constantly flowing & the lawns in the sites were half dead and not green. The amenities are fabulous though and sites are level. A great place for family gatherings. This KOA offers monthly events which I am looking forward to attending. I would highly recommend this place to anyone. I will be going back for sure. We camped at Willits KOA in a Travel Trailer. What a great park for kids! 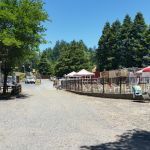 There is a lot of fun things for them--petting zoo, amazing playground, splash pad, pool, fishing pond, and an outdoor old west area that looks like they show movies there. 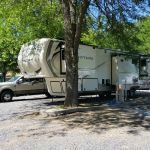 The park was really clean and easy to maneuver our 45 ft motorhome with tow. We stayed here one night and I would visit again. Note that many sites share a central area with neighbor. We camped at Willits KOA in a Motorhome. This KOA is way over priced for what you get. $62 for a very short un-level pull through is ridiculous. Most sites are water/electric, only a few of the pull through are full hookups.The site had the utilities grouped in the forward half and the cable had a total of 9 grainy channels. Site surface is gravel and out of level front to rear. Satellite reception will be iffy due to the heavy tree cover at all but a couple of sites. This KOA is more of a poor value than most. We camped at Willits KOA in a Motorhome. This is a lovely little park with a nice pool area, decent general store, hiking area, mature trees and well-kept grounds. It's laid out kinda weird but everything is accessible so it works. The spaces are set very far apart and most look to be wide and/or long enough to accommodate a rig and a tow'd. Ours has a picnic table, fire ring and a small barbecue grill... all in the back of the space. Customer service was fast and excellent. This is our first KOA experience and so far it's been very pleasant. The discount we got at the park for becoming KOA members actually paid for the membership itself, so I'll call that a win-win. I will agree with previous comments that the sites aren't very level - so make sure you pack your chocks and blocks - but I'll disagree with some others about the noise. Inconsiderate neighbors just happen sometimes and they aren't necessarily a reflection on the overall quality of the park - it's been quiet as a mouse since we pulled in. More on the site level issue: The sites are large-grade gravel (bigger rocks than usual) so if your rig is as big and heavy as mine you'll want to clear the space under your jack's foot pads of any larger stones... otherwise they'll slip-n-slide on you until they finally crush into the ground which can be a little nerve-racking. If you use those plastic pads under your jacks, I wouldn't count on being able to use them again; they're likely to get pretty chewed up. I actually couldn't level up completely because our site is low in the back and to the right. My curb-side was up off the ground already (which is fine) but to level perfectly I would have needed to lift the rear off the ground as well, meaning that only my left-front tire could have been chocked, and in my opinion that's simply not enough braking support for this much rig. It wasn't so un-level that it was uncomfortable, but if you have a propane fridge it might be an issue. We camped at Willits KOA in a Motorhome. The Mendocino coast is an hour away to the west; Clearlake is about an hour or so to the east depending on which side you go to. Despite the drought, Clearlake was completely full and beautiful when we drove by on 04/20/2016. Lots of wine-country options in just about any direction, though some of the best might be an hour and a half drive, but it's beautiful this time of year so it's worth it. Short trips to the Redwood Forest, and to Ft. Bragg and Glass Beach. Also just a short ride down to San Francisco. 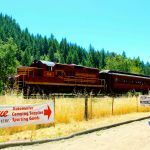 The "Skunk Train" comes right by the park and picks up there. The KOA office sells tickets. 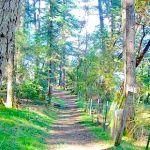 Are you affiliated with Willits KOA ?